In 2010, an internal risk management report proved the occurrence of medication errors to be one out of the top five risks in Austrian healthcare companies. Medication errors were defined as any error occurring during the prescription, transcription, dispensing, and administration of medication and were registered regardless of the detection of consequences to the concerned patients' health . Based on a survey, the Patient Safety Foundation of Switzerland ranked the 10 most common medication errors in acute care. The result included errors during the preparation of drugs, administration of drugs to the wrong patient, wrong dosages, inaccurate or missing documentations as well as the poor legibility of handwritten prescriptions . The purpose of this study is to evaluate the medication processes in 21 acute care hospitals in Austria and to develop measures to strengthen drug safety. A systematic literature review was performed. Subsequently, structured interviews of nurses and evaluation of handwritten drug prescription charts followed by an examination of oral medication via the used drug distribution systems were performed. The sample consisted of 21 hospitals. The sample consisted of 21 hospitals which prescribed 10,644 oral medications in eight months within the observed sample (Table 1). Overall, the evaluation of charts indicated, that only 28% of drug prescriptions included all necessary information (e.g. correct drug name, dosages, route and period of administration, initialing of drug prescriptions and changes). A need for improvement was located regarding information about the route of administration and the initialing of drug prescriptions. The average incidence of all registered medication errors within the drug distribution systems of all 21 hospitals was 5.1% [max. 17%; min 1%] (Figure 1). Regarding wrong dosage of drugs, an average of 0.7% [max. 5%; min. 0%] was registered and can be rated as very low. These findings correspond to the information on medication errors in drug distribution systems in Germany . 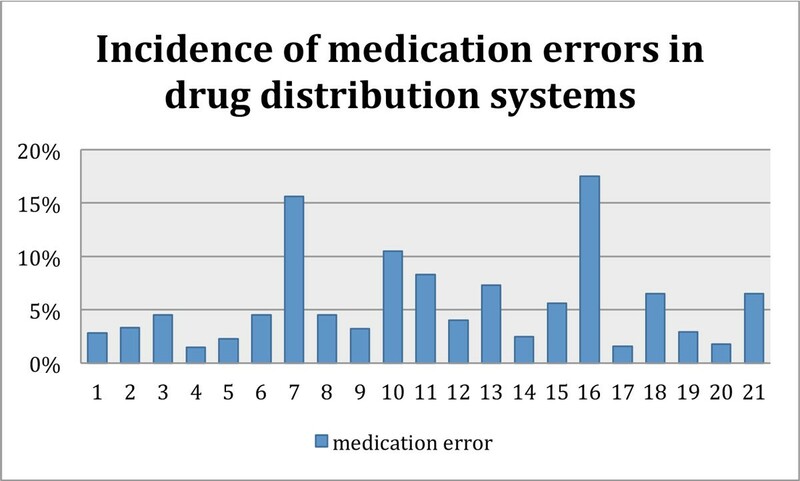 Medication errors in drug distribution systems in different hospitals. Structured interviews of nurses included questions about the availability of an internal control system and possibilities to avoid disturbances and interruptions while doing high risk care activities. In the meantime, an internal control system to reduce medication errors was implemented at a total of 47.7% of all wards. Furthermore, around 45% of medical and surgical wards complained that disturbances and interruptions during the preparation of drugs couldn't be entirely avoided. In order to strengthen drug safety a sustainable, interdisciplinary, modular medication training program and internal corporate guidelines for the medical staff were developed and implemented into acute care.